TORONTO — Canadian international forward Janine Beckie has signed a one-year contract extension with Manchester City. Beckie, 24, joined the English club last August on a one-year deal from New Jersey-based Sky Blue FC of the National Women's Soccer League. 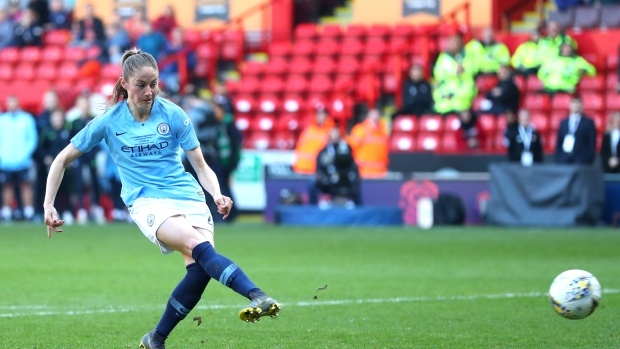 "It's been a busy, fast first year but I'm so excited to be staying with the club," Beckie told Man City's TV channel. "I couldn't imagine being anywhere else." In February, Beckie proved to be the difference in a 4-2 penalty shootout win over Arsenal in the final of the FA Women's Continental League Cup. The Man City women are after the treble this year. They currently stand second in the FA Women's Super League at 13-0-5, one point behind Arsenal (15-2-0). Beckie's team is also still in contention for the SSE Women's FA Cup with a semifinal matchup against defending champion Chelsea on Sunday. West Ham, whose roster includes Canadian striker Adriana Leon, faces Reading in the other semifinal. Beckie has won 54 caps for Canada with 25 goals. She scored three goals in the 2016 Rio Olympics to help Canada win bronze. Beckie, whose parents came from Saskatchewan, grew up in Colorado and holds Canadian and U.S. citizenship. A star at Texas Tech, where she became the Red Raiders' all-time leading scorer with 57 goals, Beckie was taken by the Houston Dash in the first round (eighth overall) in the 2016 NWSL college draft. Sky Blue acquired her in a trade in January 2018.